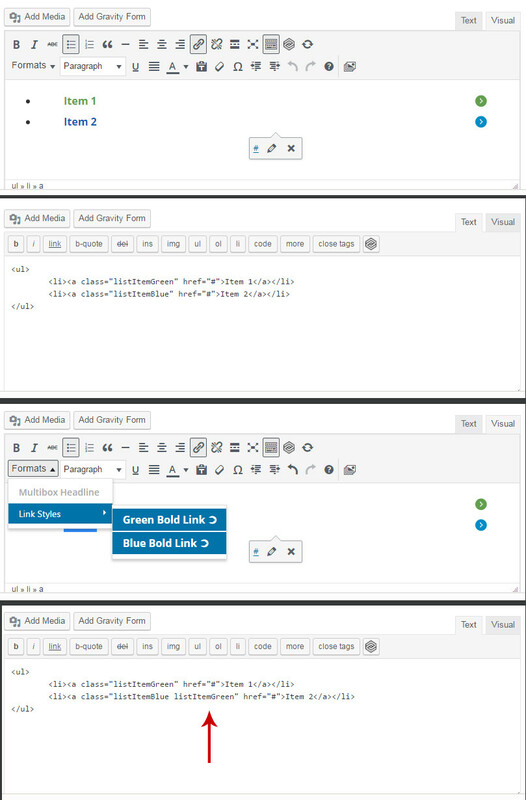 Followed several tutorials and have added custom classes in the formats section of the visual editor. The classes used are being appended and not replaced as I had intended. Is there a way to have them overwrite the existing style if there is one instead of adding to the class tag? My use case is this: Content editor lands on the visual editor page and clicks into the visual editor. They select a piece of text and select a class from the formats dropdown I have added. They dont like the color of the link and decide to change it by going back up to the formats tab and selecting a different value. Behind the scenes, WordPress replaces the class. I realize I could use the styles key in the json array, but that would produce inline-styles, which I'd like to avoid. Browse other questions tagged tinymce visual-editor post-editor or ask your own question.